The Curious Pebble Project: An amazing day... And a Thank You. An amazing day... And a Thank You. I don't know if it was sheer blind luck, Karma, or some other force of Good, but yesterday the unbelievable happened. My 'lil Etsy Shop went Bananas. I was in complete and utter bewilderment about it all for most of the day, until a kind reader clued me in... As it turns out, I was featured in the Etsy Finds email newsletter, which seems to have SCADS of readers, most of whom apparently clicked on my Japan Relief Curious Pebble. At 9AM yesterday morning, I had something like 34 views on that Pebble. As I write this, there are now over 2260 views on that item, alone. It's been "hearted" like a million times and my shop has seen exponential growth. I'm a very strange combination of grateful, bewildered and awed at the moment. Of course, I immediately subscribed to the email list, but, they don't back-post these things, and while I did get today's Etsy Finds in my mailbox this morning, I haven't actually SEEN the mechanism by which I sold FOURTEEN sweet 'lil Relief Pebbles. Fourteen. Yep. I'm hoping that someone might still have a copy of it in their mailbox? And, that this person would be so kind to forward it to curiouspebble(at)cox.net? That would be truly a kind-hearted thing to do, as I am ridiculously curious about all sorts of things (including pebbles, 'natch). Did I mention that I sold FOURTEEN yesterday? And that those sales mean $140 in donations to the Red Cross Japan Tsunami and Earthquake Relief? Which is ever so much more than I'd be able to donate all by my lonesome? Again... I'm stunned and amazed. Thank you, thank you to those of you who have found me and my little Found Art Project through this little miracle. My blog has never seen so many hits, and I even have a few new followers. Many of you have written such nice things to me via this blog and via Etsy Conversations... I'm so pleased that you like what I'm doing and that you took the time to let me know. For a while, I've been floundering for an audience, and have been wondering if this project was going to die a slow and painful death. I have to go crochet some Pebbles until my fingers bleed, now. But that's fine. I have band-aids. I'm visitng via Alicia's blog. 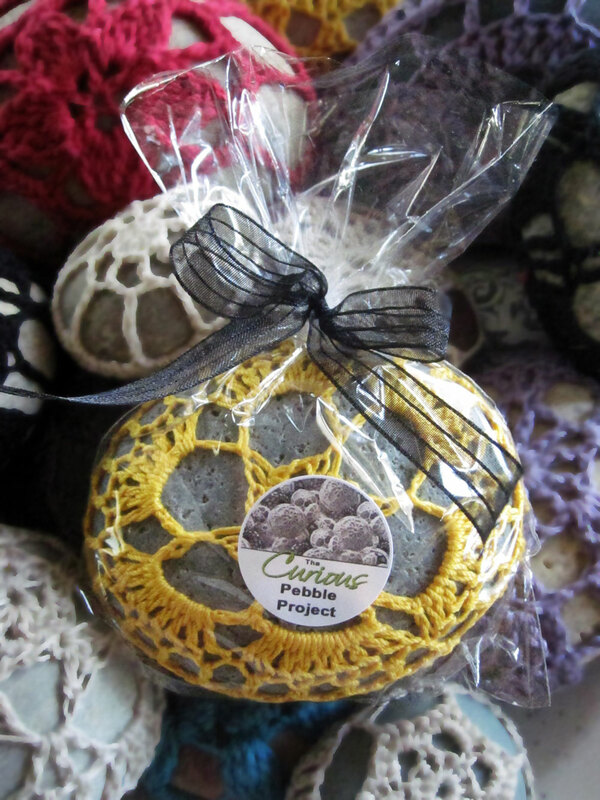 I love crocheted stones and absolutely love your Curious Pebble project. I voted. i would like to be able to say that if i spotted one of your stones I would leave it for someone else to enjoy also but I'm afraid i wouldn't be able to leave that pretty little stone. I would have to give it a home. I am really looking forward to looking around your blog to see your work. Congratulations on your etsy shop.